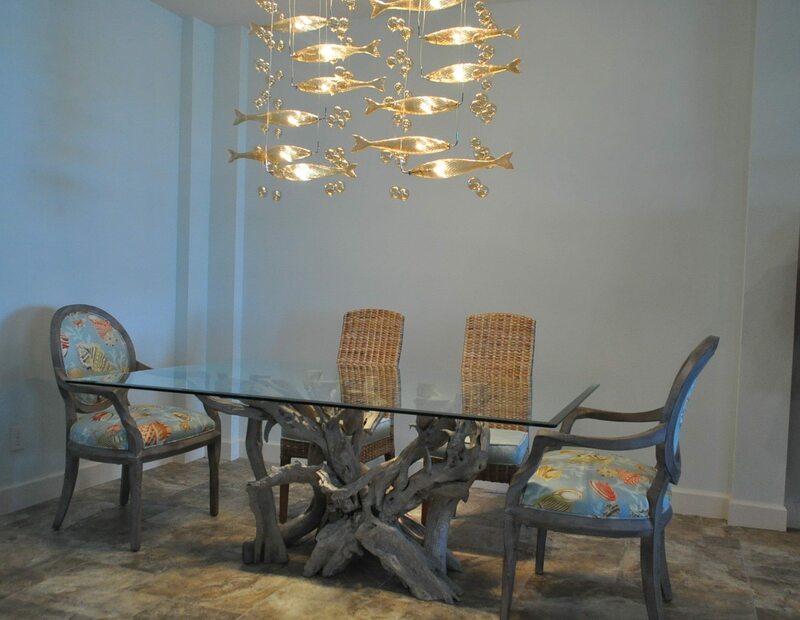 I just returned from delivering a driftwood dining table to a customers new home in Lakewood Ranch, a community near Sarasota, Fl. Several months ago they drove up to my shop in Orlando & choose one that was in the weathering process & then waited until their home was ready. As you can see from the images the table was placed under a very unique school of fish chandelier. In the future the back wall will be all mirrored. The glass measured 50 x 72 with a 1″ bevel. As it worked out I was also able to meet a customer who drove up from Punta Gorda who picked up a small rectangle coffee table & matching square end table. I love the eclectic feeling of the room. What a killer chandelier! Great marine feel to that room. 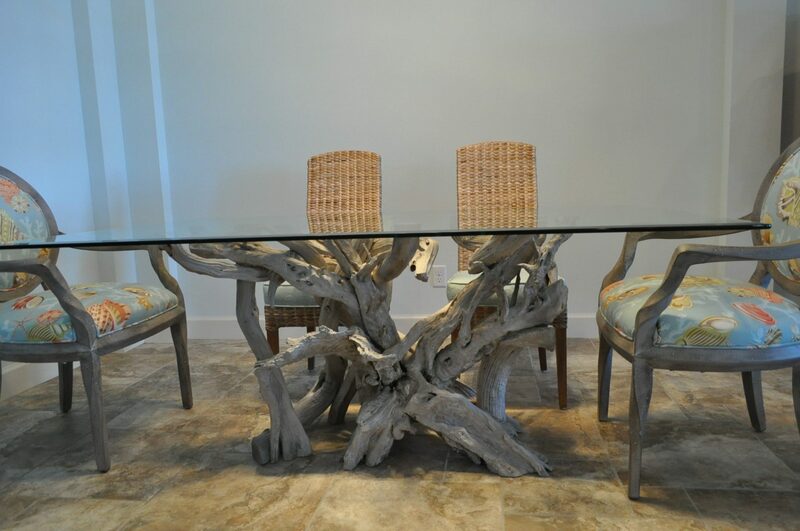 School of yellowtail and driftwood table. Can almost hear the ocean surf in the background! 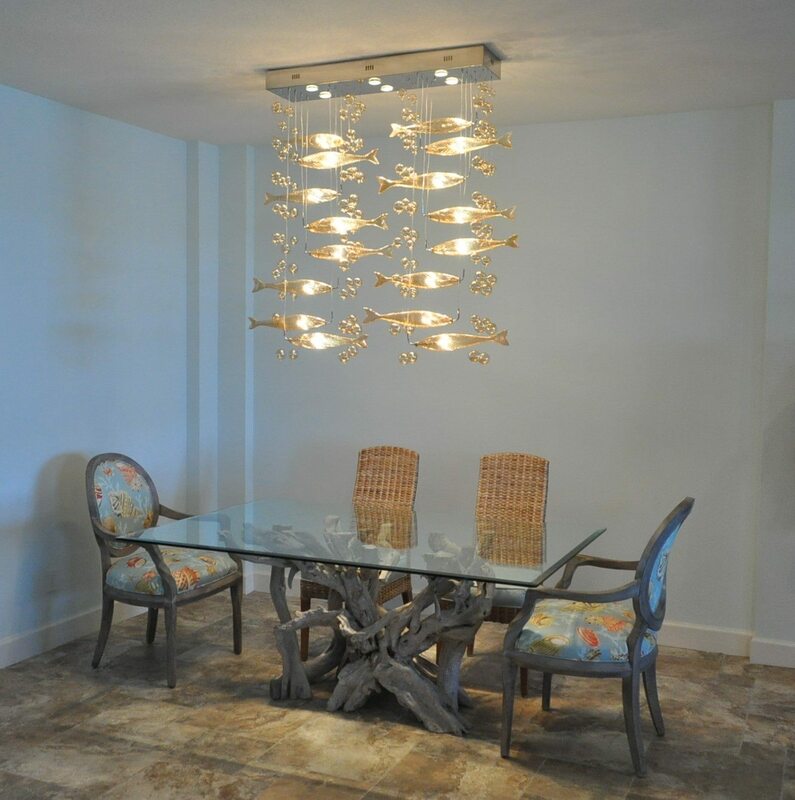 Never mind the killer chandelier….table is fantastic….I think I’ll marry you! Another beautiful piece. However, I think our dining room table was his first and we love it. We love all our pieces from Don including two tables, a lamp and two mirrors. He’s the best! Can’t wait to see what new projects he starts. Thanks Yvonne & John. Since I don’t do the Sunfest show anymore I don’t get to see you all. Even though a few (too many) years have passed I always appreciate hearing from some of my favorite customers & knowing that they still are enjoying my work. I’m glad that you visited my new & improved website that my son & his fiance have so graciously created for me. Have a very Merry Christmas.